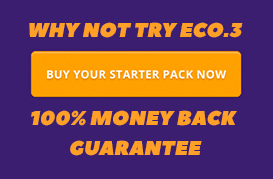 Why Choose ECO.3 and not ECOVER, METHOD, ASTONISH etc. You’ve no doubt heard of Ecover, Method and Astonish as the standard by which all so called ‘Green’ products are judged. Quite right too as these are all very good products and are widely available through the major retail stores and supermarkets. So why don’t we do the same? Our philosophy is completely different to our competitors. We work with our customers and only sell our products online in order to reduce overheads and provide our customers with the best products at the best possible price. Let us give you an example of what we mean. We have researched products and pricing across a wide range of outlets, and here’s where we fit in the big scheme of things. The products highlighted in pink are the best selling branded products that are not marketed as ‘Green’ or eco-friendly. 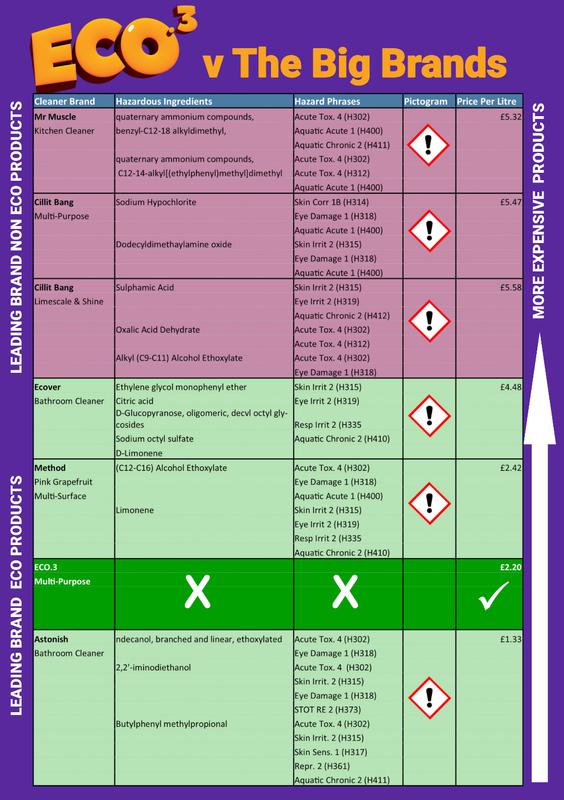 The products highlighted in green are the major product brands associated with eco-cleaning. Each and every product MSD (Material Safety Data) sheet contains the Caution pictogram. You will note that ECO.3® Multi- Purpose Cleaner does not. In fact, according to the Green Chemistry Department at York University report, ECO.3® cleaner concentrate is safe to dispose of down surface drains under current EU Legislation and does not require a Caution pictogram or any other form of warning statement. So, we have established ECO.3®’s Green Credentials and can confirm that it is without doubt the most eco-responsible product on the market. Let’s have a look at price. As we can see, the average price that each of the products in the table are sold at is shown. Whilst Astonish comes in as the lowest priced product, ECO.3® is there as the most competitively priced product in the list. When price is compared, added to green credentials, without doubt ECO.3® comes out top in our comparison chart. So now to the big question. How does ECO.3® compare in cleaning power to all the other products? This is not an easy question to answer and a great deal of money is spent on advertising in order to convince you, the buyer, that their product cleans better than all the rest. All of us remember the Fairy Liquid ads with a million plates and loads of bubbles. These ads made Fairy Liquid the best selling washing up liquid in the UK. However, here at ECO.3® we take a different view. If we spent shed-loads of money advertising our products in an attempt to persuade you that our products are best, we would have to add the cost of these ads to our product – making it more expensive for you the customer. In addition, as the new kid on the block, you probably wouldn’t believe us anyway. What we can say is that we have tested our products against all the competition and what we earnestly believe is that ECO.3® cleans better than all our direct competition. But we appreciate that you will probably think “Well, they would say that!” We are so confident that you will be totally satisfied that we offer a 100% Money Back Guarantee. Our cleaning products are better; our microfibre is among the best on the market and lasts several years; our coatings and preparations are unique and none of our competitors can offer the range that ECO.3® offers to our customers. So, in effect our view is very simple. 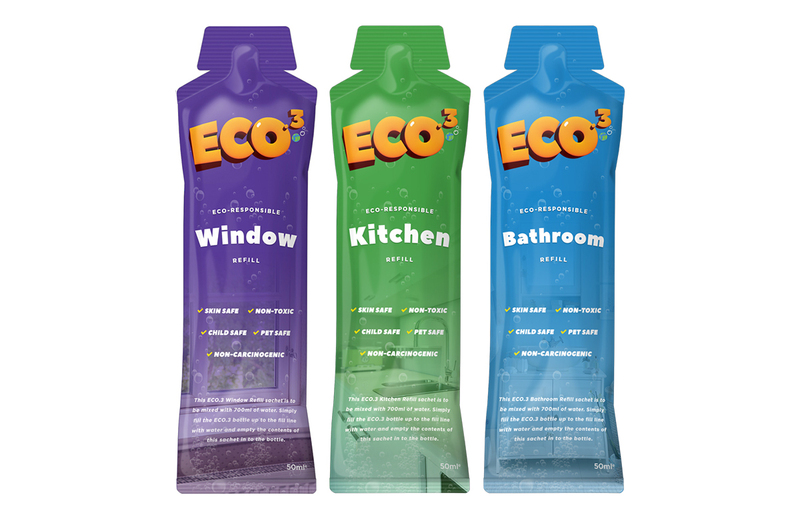 Forget the big advertising budget and offer our ECO.3® products to you at the best price possible. We let you judge how good they are and if you are not completely satisfied, then you can simply send the products back to us and we will refund your purchase. 100% guaranteed. If you really won’t take our word for how good our products are, then take a look at the reviews and testimonials on our website and see what our customers say. Oh, and by the way, we don’t pay people for reviewing our products. What you see published on our website are 100% GENUINE CUSTOMER REVIEWS. If you like what we do, then please join us and post your own review. By joining us online, you are contributing to the success of a truly global move toward the education of environmental issues and the useage of truly safe and eco-responsible products around the home. In fact, if you feel strongly about the issues surrounding the damage to our environment, pets, children and health caused by toxic and harmful chemicals, then why not become one of our ECO.3® Product Champions and demonstrate to people the benefits of an eco-safe and eco-responsible home? In conclusion, we have established that overall ECO.3® is the greenest product and saves you money based on its lower cost price, and we know that it cleans better than the competition. Please try it….you might be really glad you did.